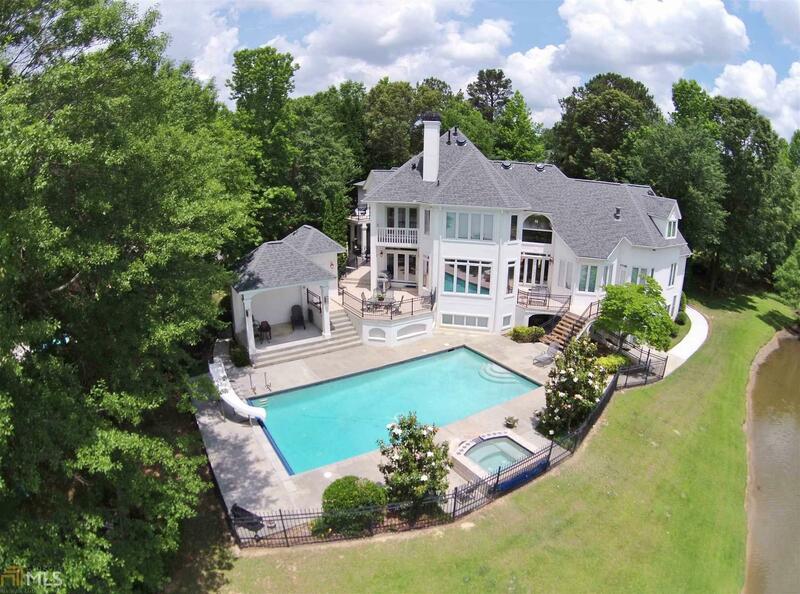 Entertainers Dream: Incredible Waterfront PTC Location! Lake & Golf Course Views! Large Custom Built Home: 8 BR&apos;s, 6 Full BA&apos;s, 2 Half BA&apos;s, Library, Rec Room, Marble & Hardwood flooring. 2 Tiled Terraces overlook In-Ground Gunite Saltwater Pool & Spa w/ R-Trac Cover. Separate Pool House w/ Covered Patio. 2 complete In-Law/Apartments w/ outside entrances! Workshop/Storage w/ outside entrance. Master Suite w/ F/P and adjoining Library. Plush Master BA w/ Oversized Whirlpool Tub and Separate Steam-Equipped Shower. Large Laundry Room. Cul-De-Sac Lot. "SMART" Home Wiring. Oversized 3-Car Garage w/ Openers. This is One Home You Must See to Believe! Few Lots in PTC have the Incredible Views this Home Has! Directions: South On 74 In Peachtree City. Left On Crosstown Drive. Right On S Peachtree Parkway, Right On Braelinn Road, & Right On Pleasance Grove. Home At End Of Street On Cul-De-Sac.